New controversy has broken out over the destruction of ancient woodland by the HS2 high speed rail link. It should be removed from a metric aimed at ensuring "no net loss" of biodiversity from the high speed rail project, as its inclusion "gives the impression that it is tradeable or replaceable". The report said HS2 Ltd must be far more ambitious in compensating effectively for unavoidable losses of ancient woodland, creating 30 hectares of new woodland for every hectare lost. This is much higher than the metric which would lead to a ratio of around five hectares created for each hectare lost. But in its response to the report, the Department for Transport (DfT) rejected the findings, saying that "given the evidential basis is lacking, this part of the report should be seen as a stimulus for debate". The Woodland Trust, which welcomed the findings by Natural England, responded angrily to the DfT's statement. Beccy Speight, chief executive of the conservation charity, said: "For DfT to outright reject the findings of Natural England on the planting ratio of 30:1 is a very dangerous situation. "Natural England are the expert advisers to the Government on the natural environment, so it seems inappropriate that DfT should question the expertise and experience of the Government's own statutory advisory body on matters of environmental protection." She added: "You can't achieve 'no net loss of biodiversity' if you're destroying irreplaceable ancient woodland - it's impossible. "This report is clarification that HS2 has failed on its key objective of 'no net loss of biodiversity' and that this project will be to the detriment of the natural environment." 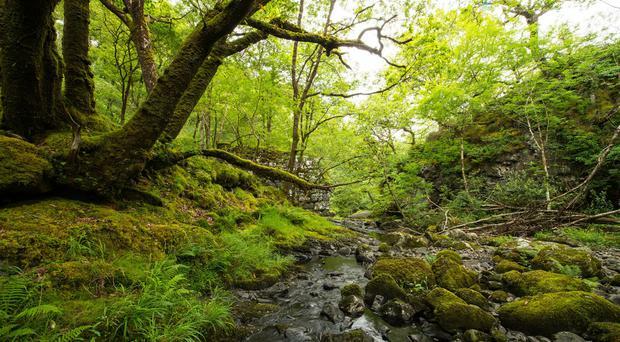 The Woodland Trust estimates around 900 hectares (2,200 acres) of new woodland will need to be created to replace 30 hectares of ancient woodland (74 acres) lost in phase one of the scheme, from London to the West Midlands. But the National Farmers' Union raised concerns about the 30:1 ratio and its impact on farmland, and called for quality over quantity of new habitat. NFU vice president Guy Smith said: "High quality farmland should not be used to create low quality habitat and exacerbate our need to import food at potentially higher cost to the environment, or woodlands, abroad." A Department for Transport spokesman said: "We agree with the vast majority of the recommendations in the report. "However, Natural England admit that there is very little evidence to support the recommendation to create 30 hectares of woodland for every one lost in building HS2, and we therefore cannot accept it. "Compensating for unavoidable ancient woodland loss is vital and Natural England recognises that HS2 Ltd is doing as much, if not more, than has ever been done before." He said the railway avoids ancient woodlands wherever possible and the Chiltern Tunnel extension would protect several more hectares of woods, while HS2 Ltd was providing 150 hectares of new woodland and establishing a £5 million fund for woodland schemes.